LiveLogic™ Digital Capture - Captures and displays digital signals with 2.5ns resolution for critical timing measurements. Two channel, 400Ms digital capture using scope probes. Includes activity LED and DVM allowing you to quickly browse your signals. Logic Source Pattern Generator - Take control of your inputs with 9 channel 100Ms digital capture, start and loop control, and editing using human-readable text files. Logic Analyzer - At 125MHz, the Logic Analyzer allows you to quickly gather and analyze up to 2,048 samples. 9 Channel 100Ms pattern generator with settable high and low logic levels. Waveform Source - Generate arbitrary waveforms or emulate battery discharge profiles or electrophysical signals with FiveWire's arbitrary waveform generator with waveform synthesis. 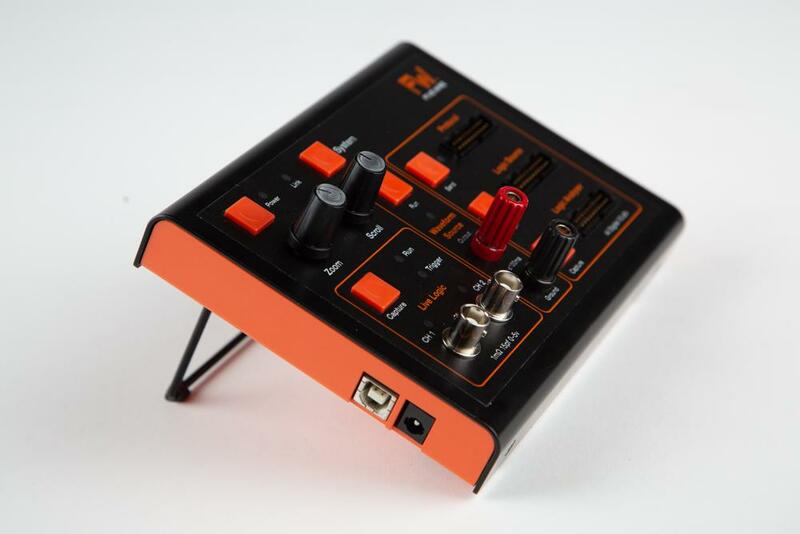 Protocol Interactive - Trigger I/O protocol probe for external input and output signals. Master or Slave controller for I2C or SPI or trigger I/O. The toolset you need to get moving fast. 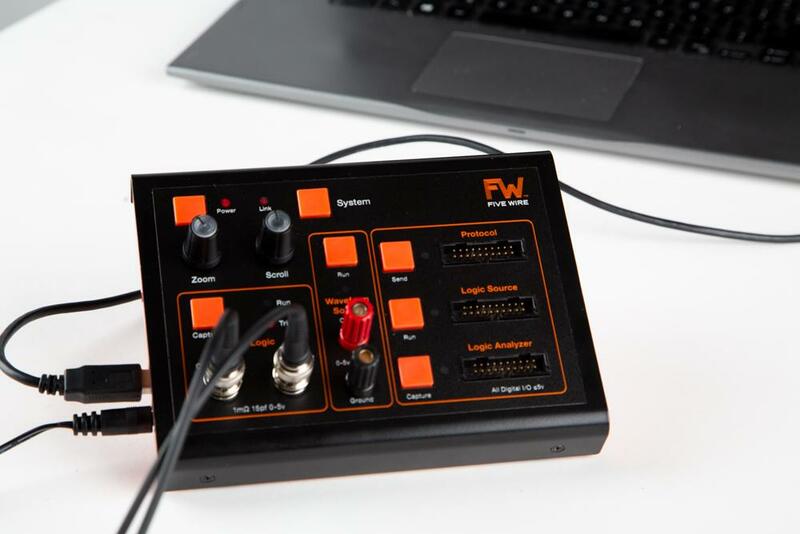 The Five Wire debugging tool allows you to quickly capture the signals you need to see to get your project moving again. 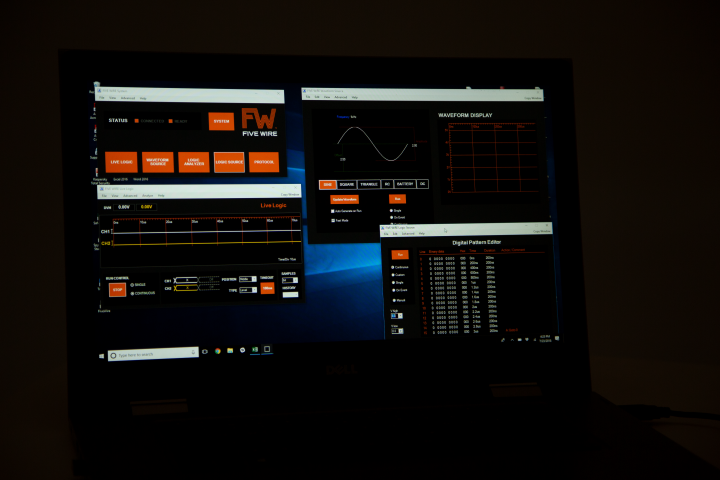 Designed by engineers who have created some of the world’s most popular test equipment, Five Wire offers precise data capture and control that gives you the power to see -- and fix -- problems faster. With the ability to run multiple tests with just one convenient tool, Five Wire offers you dependable results so you can rest easy knowing your next move is the right one. The proof is in the proving. 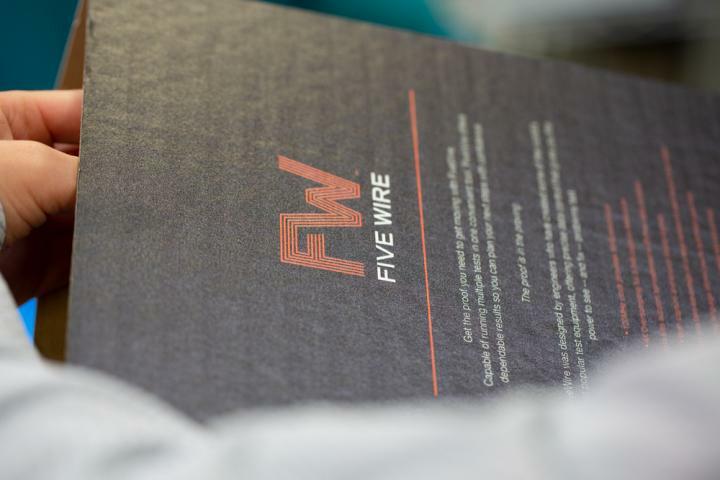 Five Wire was designed by engineers who have designed some of the world's most popular test equipment. As the industry moves increasingly to smaller, digital components, these engineers worked to develop a new tool that can source and capture the kinds of signals present in modern embedded designs. The result is Five Wire, an affordable and convenient digital multi-tool. The first step to effective problem solving is uncovering the source of the problem. 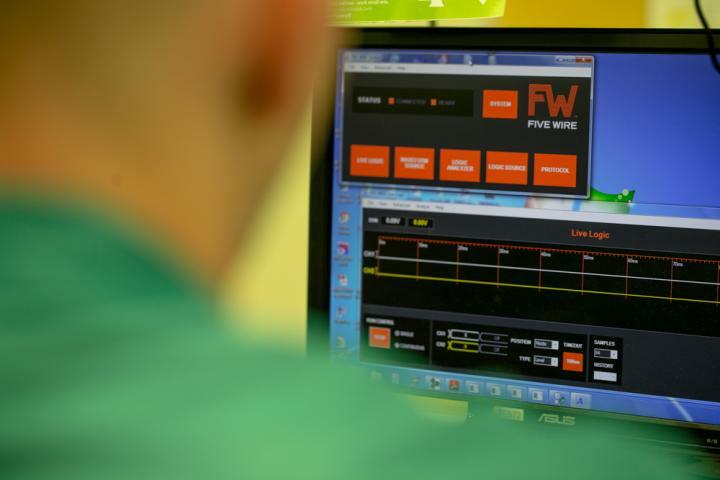 Five Wire offers precise data capture and control that allows you to control and see the problem quickly. The oscilloscope is still an invaluable tool on any bench, but it can also be slow and unwieldy when it comes to tracking digital data with idle periods. Five Wire's unique digital data capture allows you to quickly capture and record data for analysis so you can get your project back on track. 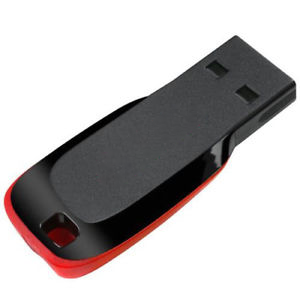 Receive the latest Five Wire software release on a USB flash drive. 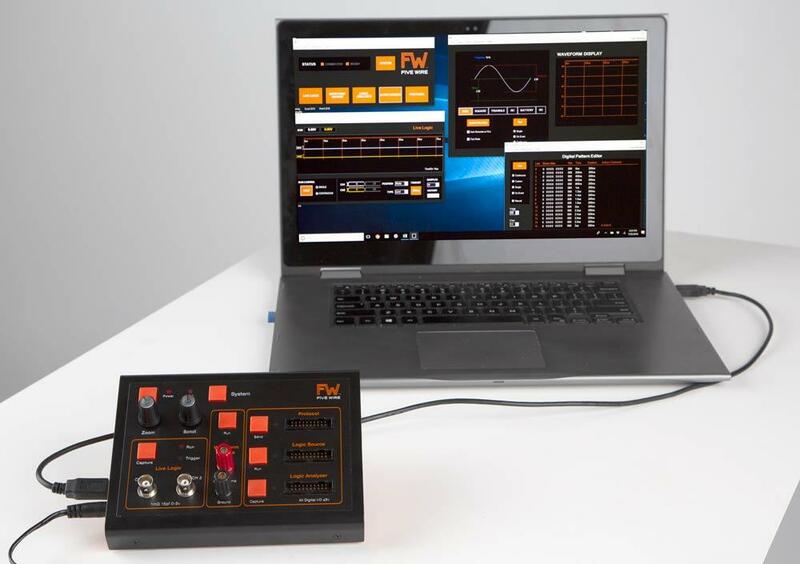 The software can be used offline (without an instrument) to explore product capabilities, to view shared data from a colleague, or online to control the Five Wire instrument. This software may only be used for evaluation purposes, in conjunction with a Five Wire product, or to view files created or captured using a Five Wire product. This software can be downloaded here. Download the latest Five Wire software release. The software can be used offline (without an instrument) to explore product capabilities, to view shared data from a colleague, or online to control the Five Wire instrument. This release provides minor enhancements and bug fixes.